5.4.3 The Diabetic Foot . See hyperlink for comprehensive care. 5.4.4 The Diabetic Amputee. See hyperlink for comprehensive care. Diabetic neuropathy is the most common complication of Diabetes Mellitus (DM), affecting as many as 50% of patients with type 1 and type 2 DM. A large American study estimated that 47% of patients with diabetes have some peripheral neuropathy.Diabetes increases the risk of foot ulceration and amputation more than 23-fold and neuropathy is the major contributory factor to this increased risk. Neuropathy presents as painful neuropathy in 20% of patients and it independently predicts all-cause and diabetes-related mortality . 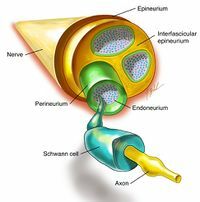 Neuropathies are characterized by a progressive loss of nerve fibre function. Cutaneous and deep sensations are mediated by superficial and deep topically distributed receptors and nerve fibers. In most patients with peripheral neuropathy, loss of sensation is directly attributable to kind, severity, and distributed loss of these sensory receptors, nerve fibers, or neurons . There is a degree of functional specificity of cutaneous and deep receptors and of their sensory nerve fibers. Thus, touch-pressure sensation of nonhairy skin is mediated by Meissner corpuscles with small receptive fields, sharp borders, and low thresholds that accommodate rapidly. Pacinian corpuscles respond to vibratory stimuli and have large receptive fields with sloping borders and low thresholds that accommodate quickly. Cooling receptors are more widely distributed and more frequent than warm receptors. Development of symptoms depends on many factors, such as total hyperglycemic exposure and other risk factors such as elevated lipids, blood pressure, smoking, increased height, and high exposure to other potentially neurotoxic agents such as ethanol. Genetic factors may also play a role. Important contributing biochemical mechanisms in the development of the more common symmetrical forms of diabetic polyneuropathy likely include the polyol pathway, advanced glycation end products, and oxidative stress. tall stature! It is thought that this may be because longer nerve fibres are more susceptible to injury. More than half of cases are distal symmetric polyneuropathy. Focal syndromes such as carpal tunnel syndrome (14-30%), radiculopathies/plexopathies, and cranial neuropathies account for the rest. Motor problems may include distal, proximal, or more focal weakness. In the upper limbs- distal motor symptoms often include impaired fine hand coordination. In the lower limbs - Mild drop foot or frequent tripping may be early symptoms of lower limb weakness. Symptoms of proximal limb weakness include difficulty climbing up and down stairs, difficulty getting up from a seated or supine position, falls due to the knees giving way, and difficulty raising the arms above the shoulders. A slow, insidious onset sensory neuropathy typically shows a stocking-and-glove distribution in the distal extremities. Sensory symptoms may be negative or positive, diffuse or focal. Negative sensory symptoms include feelings of numbness or deadness, which patients may describe as being akin to wearing gloves or socks. Loss of balance, especially with the eyes closed, and painless injuries due to loss of sensation are common. Positive symptoms may be described as burning, prickling pain, tingling, electric shock–like feelings, aching, tightness, or hypersensitivity to touch. Testing includes assessment of gross light touch and pinprick sensation. The first clinical sign that usually develops in diabetic symmetrical sensorimotor polyneuropathy is reduction of vibratory and pinprick sensation over the toes. As disease progresses, the level of decreased sensation may move upward into the legs and then from the hands into the arms, a pattern often referred to as "stocking and glove" sensory loss. Very severely affected patients may loose sensation in a "shield" distribution on the chest. Vibratory sense in the feet is tested with a 128-Hz tuning fork placed at the base of the great toenail. Deep tendon reflexes are commonly hypoactive or absent. A classification system by Thomas  combines anatomy and pathophysiology. Opioids: Dextromethorphan; Morphine sustained release; Oxycodene; Tapentadol; Tramadol. Research has shown that strength training can moderately improve muscle function in people with peripheral neuropathy (PN). Regular exercise can also help reduce neuropathic pain and help control blood sugar levels. Diabetic clients must tightly monitor their blood sugar levels during exercise to prevent major fluctuations. This may involve educating clients and monitoring blood sugars, ideally through a multi disciplined approach in rehabilitation. The youtube below shows some good exercises that a physiotherapist can employ to help manage the symptoms of diabetic neuropathy. A 2014 review found that the biggest consequence of diabetic neuropathy was a increase in risk of falls. Therefore balance and falls prevention programs and or training, in the senior diabetic clientele in particular, by a physiotherapy is very beneficial. Physiotherapy may also involve splinting for mononeuropathies eg. carpal tunnel or for muscle weakness eg Ankle foot orthoses. The Diabetic Foot . See hyperlink for comprehensive care. The Diabetic Amputee. See hyperlink for comprehensive care. ↑ Thomas PK. Classification, differential diagnosis, and staging of diabetic peripheral neuropathy. Diabetes. Sep 1997;46 Suppl 2:S54-7.